Well it’s not every week you have a clean sweep with all teams winning, but that’s what the Fitzroy Football Club achieved last weekend. 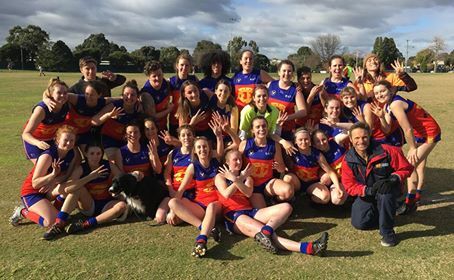 The day started well with the Fitzroy-ACU Women’s Reserves winning their fourth game in a row – the first time the team has done that – to move into third spot on the ladder ahead of their opponents, Caufield. Finals are looking likely at this stage if Simon Jackson and his team can keep improving as they have all year. Tash Kroussov kicked two goals in a total of 4.8.32 to Caufield’s 1.0.6. Tess Young, Bridie Murphy and Tash were among the best players. The win proved an inspiration for the Senior Women’s side, which built their win on the back of some great pressure and excellent tackling; in fact the VAFA’s review of the season’s stats so far show the Fitzroy-ACU Senior Women’s side is the best tackling side in the Premier competition (more on that later). 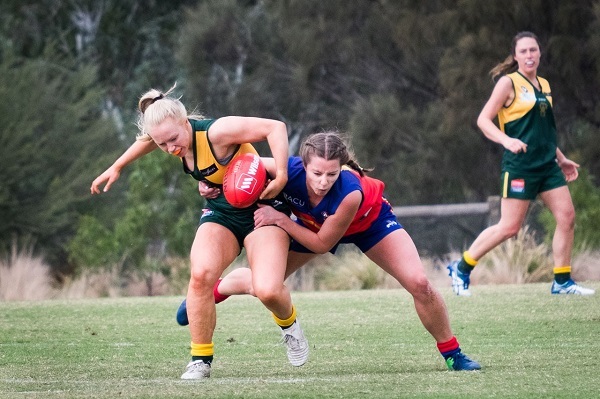 Having been on the wrong side of the luck so far this season, perhaps things turned on Saturday for our Senior women, as Caufield could not buy a goal and finished with 1.11.17 to Fitzroy-ACU’s 4.2.26. The Fitzroy goals were shared around and Bethany West, Sarah Lynas and Emma Craven led the way as best players. Check out the interview with Mick Symons and captain Gemma Minuz, who celebrated her birthday with the win. The Fitzroy Thirds continued their winning streak to tip Williamstown CYMS out of the four and take their spot. That’s five wins in a row for the Thirds, who are feeling good about life and priming themselves for the ultimate challenge against the top team, De La Salle, on the home deck at Ramsden Street on Saturday. Last season’s leading goal kicker, Simon Heather, proved difficult to stop with four goals and Liam Webb kicked three. Jamie MacKay and Alasdair Mulligan joined Webb as the best players on the day. 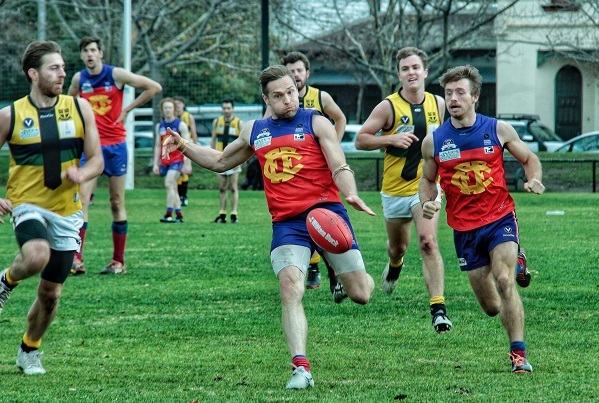 The Thirds will join the Under 19s for a Fitzroy home double header this weekend at Ramsden Street as the Senior men’s and women’s squads play away. The Thirds start at 11.40am with the Under 19s hoping to also stretch their winning run with the 2pm start against Williamstown. Five goals from John Jorgensen proved the difference as the Under 19s continued their resurgence and notched their fourth win over Old Ivanhoe last weekend. The captain, Riley Harry-Blackall, led from the front, ably assisted by Miles Nelson, who also kicked three goals. This week is likely to provide the most stern test for the Unders. Three teams have broken away from the pack in the Under 19s Section 2 competition with 8 wins and 2 losses apiece, and this week’s opponent Williamstown CYMS is one of them. Greg Coleman and his team will be well aware of the challenge and keen to test themselves to see if they can stay in the group battling for fourth spot. If winning is infectious then the Men’s Reserves have got a bad case and managed to pass it to the others; with 10 wins from 10 games, you could just about say they were perfect…although that would be tempting fate. It didn’t feel too perfect for Sam Batterton (surgery) and Michael Cussen (hospital) who ended up in the emergency ward before the end of the day. Both are recovering but the injury prone Cussen might be out for a while with three broken ribs. With two men down you might think they’d let the opposition in for a few goals: not likely. Fitzroy’s Reserves defeated St Mary’s Salesian 20.17.137 to 0.4.4 with Aaron Tatchell, having recovered from a shoulder injury, booting five goals, ably supported by Chris Brown with four and Sean Laidlaw, Drew Olarenshaw (best on ground in his 150th game) and Gus Richardson kicking two each. And the Seniors finished the day with another cracking win over St Mary’s; this time the margin was 139 points. Sam Baker’s six goals was not enough to win him BOG honours – those went to Nathan Ligris, who played an outstanding game and drove the attack from the half back line. It was a welcome return to form for the Senior side. Following a close tussle in the first quarter, Fitzroy held the slimmest of margins at quarter time with each side having kicked four goals. The home side then piled on the pressure and with a nine goal to nil second term, the game was already won. But the Roys didn’t take their foot off the throttle and the forwards lined up for a piece of the action. The 11 goal final term was something to behold. Nathan Jumeau and his captain, Julian Turner, were constantly proving a threat, with four goals each. Nino Lazzaro – a very welcome inclusion thanks to Essendon’s VLF bye – kicked three goals and Jack Dalton, Rory Angiolella, Donovan Toohey and Tom Cheshire had two each. In a total team performance, rounding out the work of those already mentioned, Matt Kyroussis and Max Ellis also stood out. For a summary of all six wins and the highlights from the men’s and women’s senior games, check out the latest Risk Care Review, brought to you by Risk Care Financial Services. All six Fitzroy teams will don black arm bands on Saturday to mark the passing of Mish Booth’s father, Terry. Mish is vice captain of the Women’s Reserves side and inaugural winner of the Janet Graham Perpetual Trophy as the best and fairest player in 2016. Our love and thoughts are with Mish, her mum Chez and sisters Jux, Dee and Trace. His great grandfather played in the 1913 Fitzroy Premiership side, his grandfather was an Australian middleweight boxing champion and thirds player known as the ‘pride of Fitzroy’, and he loves singing the club song as he runs out onto the ground. 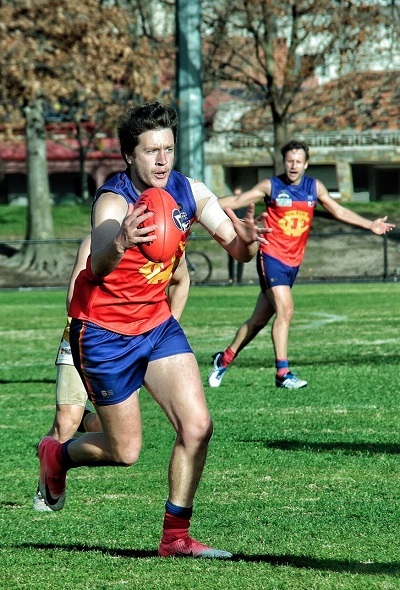 Donovan Toohey was born to play with Fitzroy. At just 18 (he played his first senior game at 17) and still in Year 12 at Northcote High School, Donovan has come into the Fitzroy senior side in 2018 and hasn’t missed a beat. 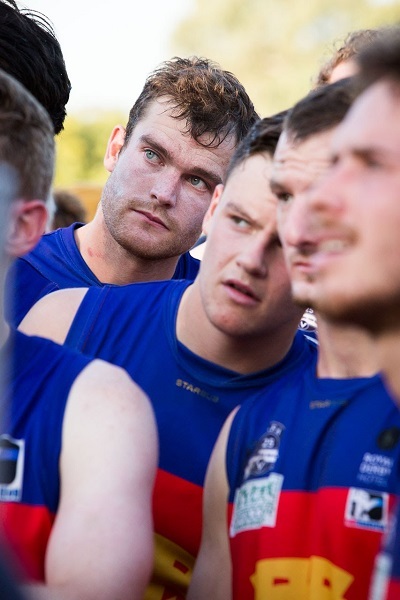 And the number 57 has some pretty clear goals – follow in the footsteps of his great grandfather and win a premiership for Fitzroy and earn the right to wear Jim Toohey senior’s number 7 guernsey. “I am absolutely loving my time at Fitzroy so far,” Donovan says. “It has been my most enjoyable season of footy to date. The thing that I have noticed the most is the community feel around the club with the wonderful volunteers who help out around the club to make it run so efficiently. It’s been a pleasure running out on a ground with such history and tradition and speaking to a few of the ‘old’ Fitzroy heads. 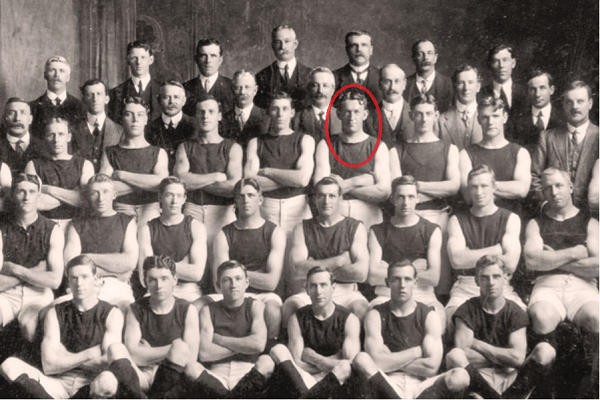 Whilst we have a number of players who have links back to the Fitzroy of old, few can claim the pedigree of young gun Donovan. 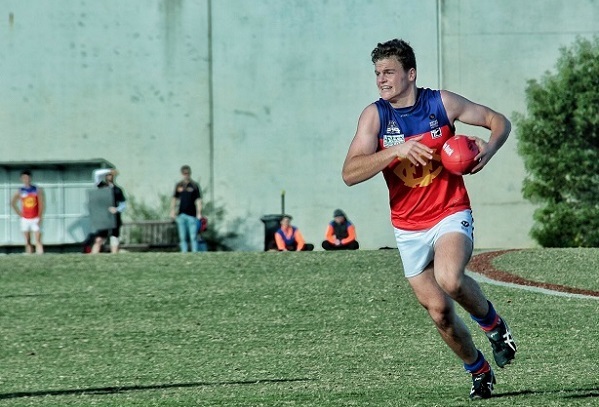 And it’s lucky for Fitzroy fans the impressive all-round sportsman has set his sights on extending the Toohey family legacy in the tricolours, coming across to the Fitzroy Juniors from Parkside last year. Having recently been named in the VAFA Under 19 squad, Donovan was this week named in the Vic Metro cricket squad to train in the lead up to the Under 19 National Championships. “I’ve been playing cricket since I can remember,” Donovan says. 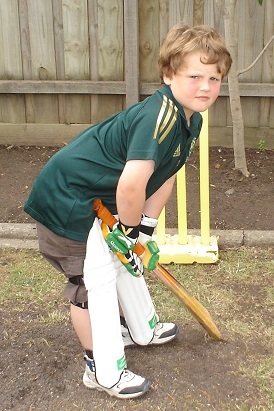 “From forcing my dad to bowl to be all day in the backyard, to now playing Premier cricket at Essendon. I am a wicket-keeper batsmen who bats left-handed. 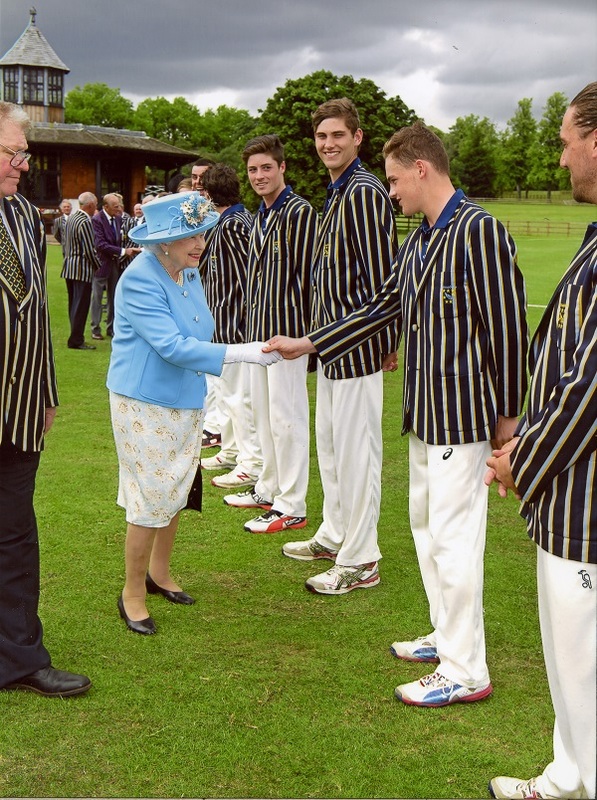 Growing up my hero was Adam Gilchrist, which is why I decided to become a keeper.” (Check out the picture below - yes that is the Queen! Donovan drew attention with a man-of-the-match performance at Windsor Castle last year with a touring Crusaders team). However, it was his pre-season dedication to balancing cricket and footy commitments which first caught the eye of his new footy coach and Luke Mahoney has plenty of praise for his young charge. “Donovan has impressed since day one with his work ethic on the training track,” Luke said. The cricket connection has proved useful in terms of settling in with his new footy club with a few familiar faces. Nathan Jumeau and Julian Turner played cricket with Donovan at Holy Trinity and he’d also played footy at school with the Claytons and Noah Wright. Donovan says he’s getting a lot of support across the board. “Obviously all of the coaches have been awesome in guiding me through my first year of footy; they have been a great support so far. Nath and Jules have been there for me if I have any queries or problems with my footy. Some of the senior guys in the backline like Bis (Tom Biscaro), Ligga, Toby (Hudson Bevege) and E-dog (Max Ellis) have also been great in advising me, not only at training but also on match day, which has made my transition so much easier. Donovan says he’s slowly coming to grips with the step up from juniors and the physicality of the games. “I think the most important thing for me is to fulfil the role that I am told to do each week, and hopefully I can contribute to team success, by doing all the little things and one percenters that I can control. “So far this year we have been really solid as a team, and we must continue this throughout the rest of the year. As a group we must be aiming high and try to gain promotion, which I think is very achievable with this group. “I’ve been pleasantly surprised at how welcoming the club has been to me and supporting me through my first year of senior footy. I can’t wait to play many more games here into the future. Something tells us another Toohey might be on the honour board before too long. Thank you Calli and Marshall Toohey, Donovan's parents for their assistance with the article and photos. 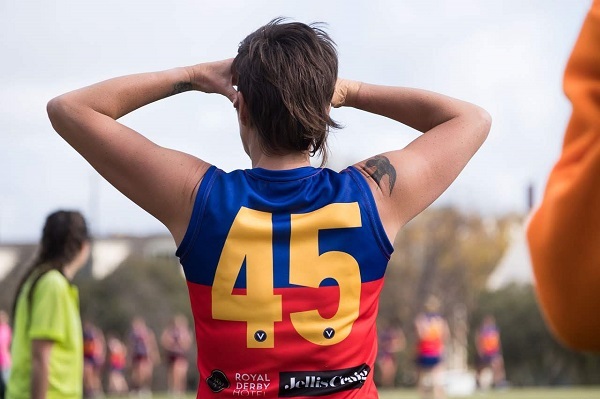 Last year’s Women’s Premier premiership winners, Marcellin, will provide a big challenge for Fitzroy-ACU this weekend as they look to gain some momentum after last week’s somewhat lucky win over Caufield. But our women have some clear strengths to draw on. In fact some of their work in the first half of the season has been first class and the VAFA broke it down during the bye week. If you don’t have access to the VAFA App then what we learnt was Fitzroy ACU players are fierce tacklers, with 10 more tackles per game than any of their opponents. Four of the Roys are in the top 10 most efficient tacklers in the competition led by Alice Batterton (pictured mid-tackle), averaging six tackles per game, Alexandra Montiero, with 5.4, Gemma Minuz 4.9 and Lucy Kerr 4.4. In fact Lucy Kerr is in the top 10 of the competition for disposals (3rd), marks (8th) and tackles (5th). Erin Gogerly, who likes to downplay her role, is more than earning her ‘Erin Everywhere’ tag playing mainly at half back, leading the competition in the number of disposals overall and in disposals per game, averaging 23.1. She’s also topping the marking stats. If the Roy Girls can string it all together, they are in with another chance of making finals…. they just have to keep winning. Here is the full VAFA mid-season review. 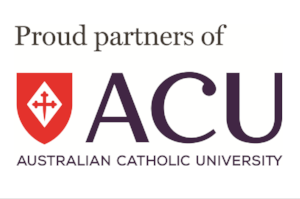 Over the past week in Melbourne, it’s been a time for reflection and consideration of how we all play a role in creating a safe community, starting with a culture of respect and equality and thinking about all of our language and actions. 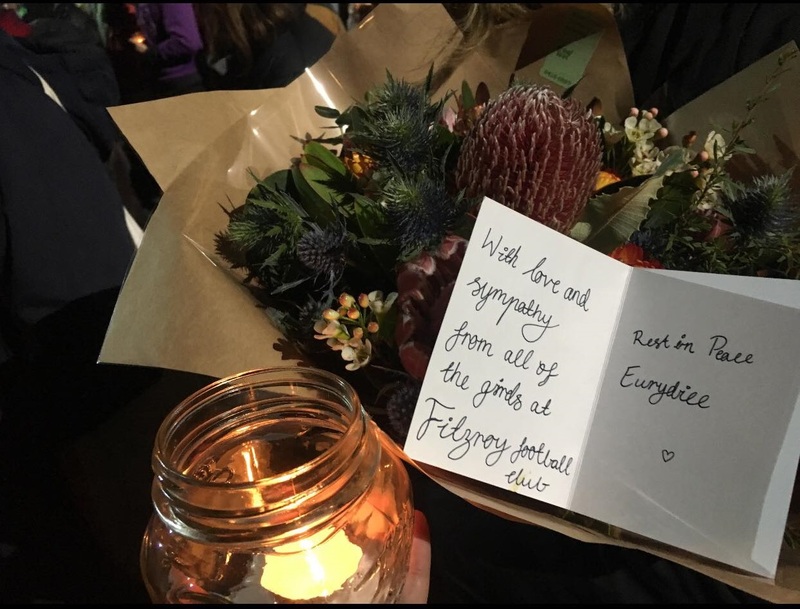 The Fitzroy-ACU squad attended the vigil for Eurydice Dixon on Monday night, leaving flowers to show their love and support. The senior men’s squad and coaches also had some quiet reflection about the role they can play as individuals through their everyday actions. 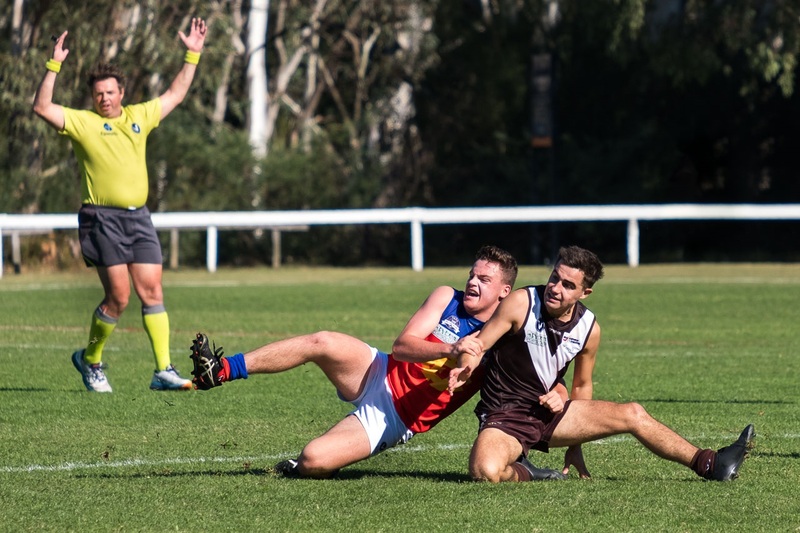 A number of VAFA clubs have led by example, including St Bernard’s, University Blacks and the Muggars and each club and team will handle things in their own way. Old Geelong will be raising funds for White Ribbon tomorrow and both Reserves and Seniors teams will be wearing white armbands in support of White Ribbon. Fitzroy plans to have a session soon inviting all players to come along and have a conversation with some guests with a background in gender equity and the Respect and Responsibility programs of the AFL. A good conversation has been started in the community and at the club. Be part of it if you can. Here are a couple of articles from during the week which look at how people can make a difference. With an 89-point loss at Brunswick Street earlier in the season still at the front of their minds, Old Geelong is bound to fight back hard when Fitzroy travels to Como Park tomorrow. After a slow start last week, the Roy Boys will need to be switched on from the word go against a side which will be pressing hard for second spot on the ladder in the second half of the season. Their form had been strong going into the bye but they will be smarting from a letdown last week against Old Camberwell and looking to bounce back strongly. This is a classic danger game as a loss would put Fitzroy back with the pack, albeit with a strong percentage. Old Geelong are bound to use their height to advantage on their home deck and have a forward line that shares the goals around. There is not much between the Reserves sides either, with Fitzroy the only team to defeat Old Geelong this season. It promises to be a great contest and a serious challenge. 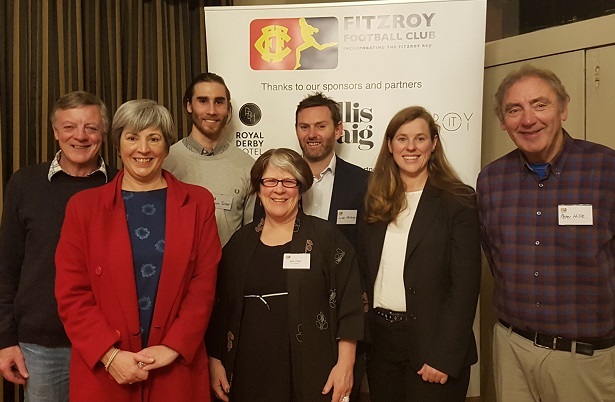 Fitzroy’s leaders came together with sponsors and community organisations on Wednesday night at the Royal Derby, thanks to the generous support of the Community Bank. Sponsoring Fitzroy for another season, the Community Bank (Clifton Hill/North Fitzroy Community Bank Branch) funded the night which saw sponsors and friends of Fitzroy come together to find out about the latest developments at the club, including hearing directly from both senior captains and coaches. This is the second time the group has come together and it’s a great opportunity to get to know the individuals behind the businesses and speak directly with the decision makers. It also allows the sponsors to network with each other and share ideas and opportunities. Thank you to the teams from the Community Bank, The Royal Derby, Jellis Craig, Das Pilates, the Fitzroy Victoria Bowls Club, Risk Care Financial Services, Fitzroy Rotary, the Reds Foundation, the Fitzroy Inner Learning Network and others who helped make the night a success. And an enormous thank you to Kevin Sharp, who is stepping down from his role as Sponsorship Director at Fitzroy, having secured a role in Spain working for a wine company – it’s a hard job but somebody had to do it. Kevin has done an outstanding job for the last two season and will be a big loss. Pictured - Fitzroy Director Kevin Sharp. Community Bank Branch Manager, Kim Dower, Men's Senior captain, Julian Turner, Fitzroy President, Joan Eddy, Senior Coach, Luke Mahoney, Bank Chair, Jenny Farrer and member of Fitzroy Rotary, the Fitzroy Victoria Bowling and Sports Club and the Reds Foundation, Peter Hille. Ahoy Fitzroy Family – your booking deadline is NOW! All aboard HMAS Fitzroy as this year’s Annual Reds Ball will be a cruise on Saturday June 30! Oh buoy, how exciting! Please feel free to join the players on this nautical adventure. Tickets are $60 to cover the cost of the cruise – this will include embarkation (that means getting on the boat, for those who don't know their port from their starboard) and some light food. You are also welcome to bring food. Drinks will be on Sail for cost price - that means beer, wine and basic spirits from $2.50 to $4. The cruise will depart from the Docklands near the Woolshed Pub at 7.30-8pm and will dock 3.5 hours later in the same place. And last boat not least, the theme is nautical. 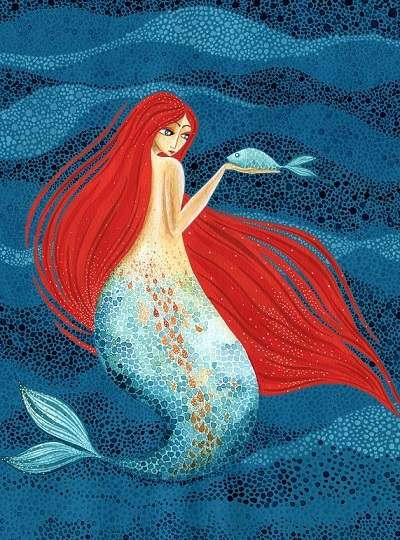 Dust off your boat shoes, get your peg legs ready and fish out your best mermaid tail for the night. So seas the day and don’t miss out on an oar-some night! 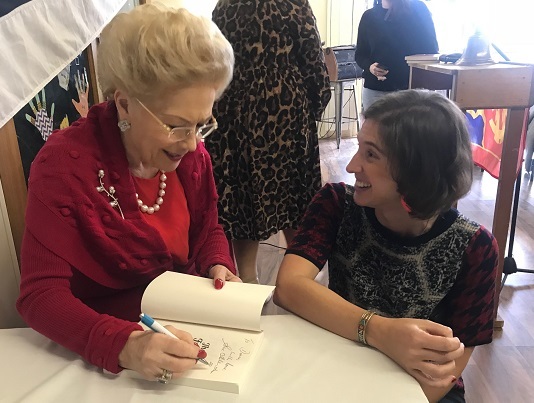 She arrived early and left late and in between she made an enormous impression. 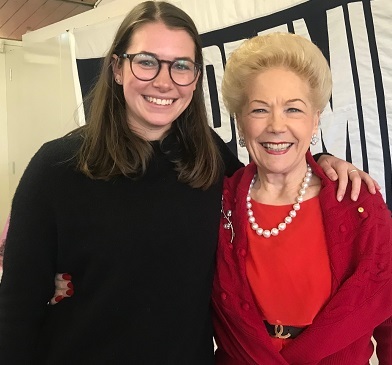 Dr Susan Alberti AC was the star turn at Fitzroy’s most recent pre-game lunch and spoke passionately and emotionally about seeing her dream of women playing AFL become a reality over the last two seasons, along with the many personal challenges she has faced and how she’s overcome them. Susan talked of her style as a young player – and we certainly believed her when she said she was a great tackler – and her immense sadness at having to give up at age 15. She also pointed out that women’s football has been played for a long time; “the first 100 years are the hardest”, she said. It’s not often you can hear a pin drop in the Community Rooms at Brunswick Street when filled with the Fitzroy faithful, but the Footy Lady achieved just that at the FitzroyIT lunch, with a word for everyone from young Bulldogs fans to councillors from the City of Yarra. She wore red for the ‘redders’ and she vowed to help in our quest for better lighting at Brunswick Street Oval. The final round home game on 25 August will be our annual Women in Football Lunch, hosted by sports journalist Megan Husthwaite. Details will be released soon. In the meantime, get ready for another political tour de force with the Reds Foundation lunch at our next home game on 14 July. Stay tuned for speaker and booking details. 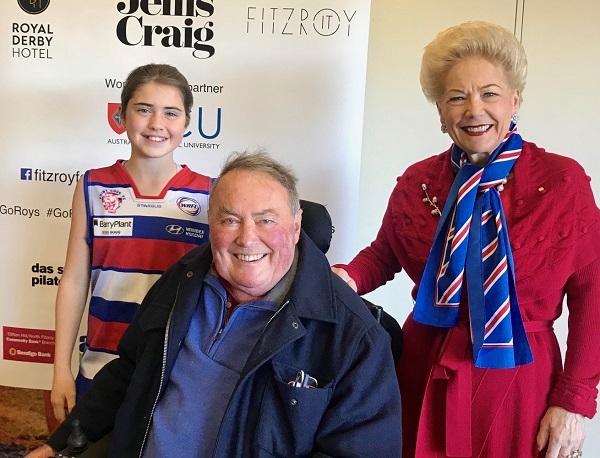 Pictured: Susan Alberti meets Tuppence Tambourini, the best defender at the Point Cook Bulldogs and grand daughter of Tom Roper, who is also pictured. Susan signs The Footy Lady for Yarra Councillor, Danae Bosler and meets Fitzroy-ACU Reserves Captain, Rachael Telfer. Been looking for a story about Jack Atkinson? Sure you saw a photo of Luci Murphy landing a tackle? Chances are you might have seen it in the RedRoy. The team at FitzroyIT have pulled together an archive of the RedRoy Mail for our website and you can find it here. Never know what you might find!